The costume designer's art lies in effective interpretation, collaboration, and execution. Doing so successfully requires a solid foundation in general artistic principles and specific knowledge of how those principles apply to contemporary costume design. 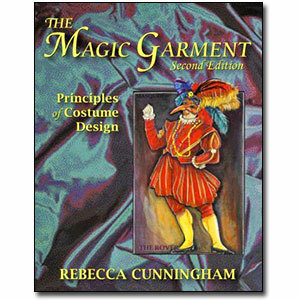 In the widely used costume design textbook The Magic Garment, the author Rebecca Cunningham presents you with just such an artistic foundation and develops it to expose beginning costume designers to the myriad skills they need to develop in order to costume successful stage productions. She begins at the most basic conceptual level — reading plays from a costume designer’s perspective. She then follows through with the practical considerations that must be considered at every stage of the costuming process — research, development, sketching, and costume construction. Rebecca Cunningham has built on the long-standing success of the outstanding first edition with new figures and updates throughout the text, including 16 pages in full color. Examples have been selected from a wide range of stage productions representing a variety of designers, styles, and approaches. Interviews with practicing designers from stage, film, and other media show the practical importance of the book's concepts. Every chapter incorporates material reflecting the increased impact of technology, especially computers, on costuming. New chapters on designing costumes for film and television and preparing for a costume design career make the second edition even more versatile and practical for every would-be and new-to-the-job costume designer. Rebecca Cunningham is Professor Emerita from Brooklyn College where she taught costume design and construction for 30 plus years. Rebecca is the 2008 recipient of the USITT Award for Outstanding Achievement in Costume Design. She is also the author of the costume design textbook, The Magic Garment, as well as Basic Sewing for Costume Construction. Rebecca has designed Off-Off Broadway, regional, and educational theater productions and is involved with the USITT Costume Commission. Her costume designs and watercolor paintings have been exhibited in New York and Louisiana.